Ever consider an Australia Camping Trip? If you have the time the “Land Down Under” serves up endless adventures. An Australia camping trip is the cure if you’re getting sick and tired of the cold winters in the Northern Hemisphere! Best of all it really doesn’t matter what time of year you decide to go “Down Under”, you just need to plan ahead and decide what you would like to see. As for me, The Camping Detective, I spent a little over 1-1/2 years in Australia on three separate trips. Originally I thought I could see it all with one trip but there was so much to see and experience. If an Australia camping trip sounds appealing, may want to first try out one of the three main possibilities. 1. East Coast–This would consist of a trip from the Snowy Mountains–Sydney-Gold Coast–Whitsunday and Fraser Islands of Queensland-Cairns and the Great Barrier Reef then to Cape York. Geraldton-Monkey Mia-100 mile beach to Broome. From there it gets really interesting! Stunning nature can be seen in The Kimberleys-Bungle Bungles-Gibb River Road to the Mitchell Plateau. 3. Central Australia-This particular trip was my first one. Beginning with Melbourne-Kangaroo Island-Adelaide (tour the wine country)-Flinders Ranges or even the Victorian Alps-North to Ayers Rock-Kings Canyon-Palm Valley-Mataranka Hot Springs then up to Darwin. 4. Tasmania-Although not unique in Landscape compared to other parts of the world but the culture there certainly makes up for it. A trip there is worth the extra effort if time allows. Here are some ways to get around while on your Australia Camping Trip. While I was traveling around Australia I used every possible mode of transportation available. •	Trains-Went from Adalaide to Alice Springs and Port Augusta to Perth. •	Buses-Rarely used them but good to use between Sydney and Canberra (The Capitol Territory). •	Hitch hiked-I often looked for rides with other travelers staying at hostels. Some of my best Australia camping trips were a result of catching rides with people from backpacker's places. This is a great way to share fuel costs. Met some great people on these trips with which I’m still in contact with. •	Car-I purchased cars in Australia on two separate occasions. The only problem is that the used cars are “very” expensive there and not necessarily "road worthy". It may be worth purchasing a car where the seller has a “buyback” option. On longer trips I often gave rides to other campers to share fuel costs as well. •	Renting Vehicles-This works well but it’s even better if you can drop off the car in another city. •	Renting a 4WD Camper-I’ll be doing this on my next trip to Australia. Having a 4WD will give you so many more options when heading out to remote areas. 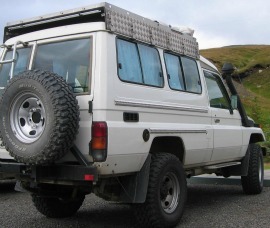 •	4WD Adventure Trips-These are great! And, they were my favorite. The camping is great because you have little to worry about. All you do is set up your tent and help do the dishes when it’s your turn. You can visit great places and not get lost because you have a guide! By doing an Australia Camping Trip you can experience the wonders from snow covered mountains to modern cities. Tropical jungles to dry deserts. silica sand beaches, white as snow, to palm trees in the middle of nowhere. Imagine yourself walking on a beautiful beach, catching a huge fish, hiking in the mountains or snorkeling and diving in the famous Barrier Reef. All while your friends and co-workers are shoveling sow back home! I didn’t even mention all the unique wildlife in Australia: Kangaroos, Tasmanian Devils, Penguins, Emus and Koalas. Hope you'll get the chance to visit Australia. We're looking forward to our next trip there. Return from Australia Camping Trip to Camping Trip Ideas Page. Our trip from Southwest Colorado to Yellowstone National Park was incredible. Camping and hiking while visiting Bryce Canyon was one of the things on my bucket list. Visiting the Grand Canyon in May is a prefect time. Nice weather and fewer crowds. Ever hear of Great Basin National Park? Most people haven't, but exploring the cave in this park is a must. This is a fun, out of the way place to visit. Thinking about camping La Sal National Forest near Moab Utah? Do it, it’s awesome! Especially if you like free camping.